I received a text yesterday from a neighbor who had a photo from another neighbor of a possible panther in our neighborhood. Now, I’ve known since I moved here that my neighborhood, which borders on the CREW Project, had possible panther activity. It’s the reason I purchased a game camera at last year’s silent eco-auction, and I take note of panther sightings posted on our neighborhood Facebook page Seeing a Florida panther in the wild is on my wildlife bucket list, so I would much rather prefer to see one a the CREW Marsh Trails than in my backyard but – any panther sighting would make my heart race with sheer joy. Why? Besides the fact that panthers are one of our two big cat species, they are also endangered – and seeing them and reporting them is an important part of citizen science. 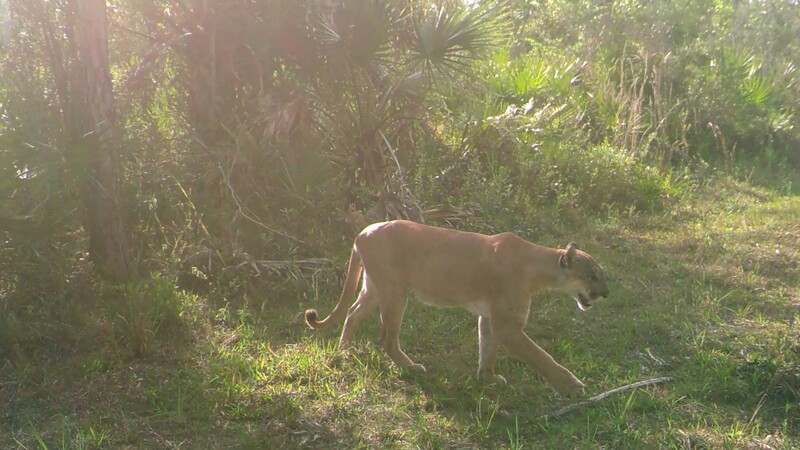 A Florida panther within the CREW Project. Photo by game camera monitored by volunteer Tom Mortenson. Florida panthers (Puma concolor coryi) are an Endangered Species. Counting panthers is difficult because they are solitary, elusive and wide-ranging animals rarely observed in the wild. Florida Fish and Wildlife Conservation Commission (FWC) panther biologists estimate there are 120-230 adults and yearlings in Florida. Reporting your observations can help FWC biologists address panther conservation needs by identifying the areas used by these large cats. I learned last year during a hike that many people don’t know that, if you see a panther, you should report it online to the Florida Fish and Wildlife Conservation Commission. So, if you do see a panther – first up, congratulations, and second, here are the steps to report this rare sighting. Snap a photo if you can of either the panther or its tracks. Using Google maps or your compass on your phone, take note of the latitude and longitude of the the sighting. You can drop a pin on your location on the Google Maps app to mark where you saw the panther and check that pin later for your GPS coordinates. Go to myfwc.com to report the sighting. Enter the latitude and longitude on the form or drag the red pin onto the map on the web page to mark the location. Enter the date of the sighting along with your information and any notes. And, if you happened to spot the panther at one of the CREW Trail Systems, let us know! We’d love to share your panther story.